The church stands next to the modern Cathedral of Athens. It was constructed at the end of the 12th century, on the ruins of an ancient temple, dedicated to goddess Eileithyia. 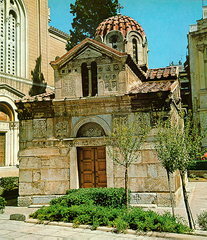 It was initially called "Little Metropolis", it was dedicated to Panaghia Gorgoepikoos and belonged to the episcopal mansion of Athens. In the 17th century it was referred to as both "Gorgoepikoos" and "Catholicon". In 1841 it housed the public library of Athens and in 1863 it was dedicated to Aghios Eleutherios. The cross-in-square church belongs to the four-column type, with a tripartite narthex, of which the vaulted, middle section is taller than the lateral ones. The walls of the church are entirely constructed of large, ancient Greek, Roman, early Byzantine marble blocks and relief plaques, without bricks. The reliefs, ninety in total, are mostly used on the upper section of the walls, resulting in a unique, for a Christian church, decoration. The dome is the only part built in the typical cloisonne masonry.